There's a new copyright book just coming out -- Privilege and Property. 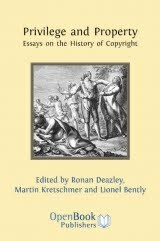 Essays on the History of Copyright, edited by Ronan Deazley, Martin Kretschmer and Lionel Bently. It's published by Open Book Publishers and comes in hardback, paperback and digital download formats. If you don't want to buy it, you will have the option of reading it online free of charge. It's not yet published, but will be very, very soon (click here) for contents, author list and other details.